Together since 2013 they are a solid front for any club or festival stage. Their single Fake Fruits topped all possible local charts and reached wider audience when aired on MTV Adria in the end of 2014. In 2015, after a sold-out gig at The 100 Club, London, JEREMY? were invited to The Great Escape Festival in Brighton, UK and Rock For People Festival in Czech Republic. Later that fall they released another two singles, enjoyed by the audience – Hope & Two Weeks to The Great Escape. The release of the single King Kong in the spring of this year teased the rock’n’roll true lovers as it presents JEREMY? in their true colors and sound. 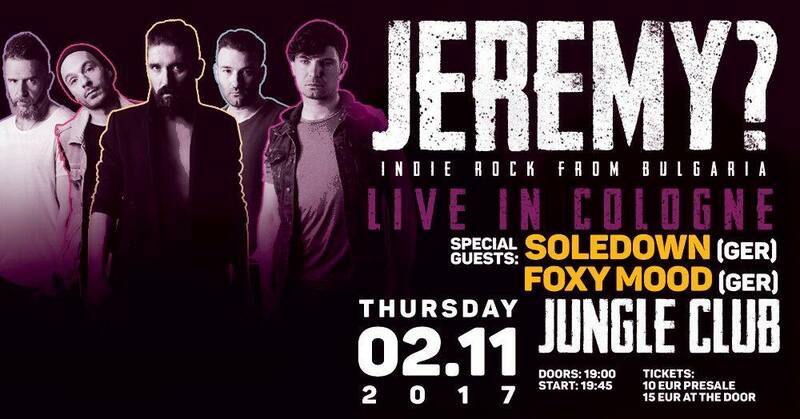 The band released their debut self-titled album JEREMY? in May 2016. In June 2016 JEREMY? joined the QUEEN + Adam Lambert Tour for their shows in Poland @ Life Festival Oświęcim, Romania Queen & Adam Lambert and Bulgaria. JEREMY? presented their new album in front of more than 30 000 people and won surely one of the best audiences to play for, the notorious rock band QUEEN’s youngest true fans. In July 2016 JEREMY? were invited to play on Fusion Stage, EXIT Festival, Novi Sad, Serbia as well as headlining numerous local festival stages.